The St. Bonaventure home crowd was ready to go on Friday night. If the Reilly Center wasn’t a sell-out, it was close to it and the fans were roaring from the opening tip. Bonas fans have always been vocal and “bled brown and white” so to speak. Often times (I’m guaranteeing we’ll see this during the season), they travel well too, almost creating a home court advantage on the opponent’s floor. LaDarien Griffin has definitely made some strides since last season. Posting a double-double (including two rim-shaking dunks), he played with a lot more confidence than ever before. With the front court lacking the depth it does, Griffin’s play was a pleasant surprise. Freshman Izaiah Brockington only received three minutes of play but looked good in that brief time. Last season, a freshman who I was looking forward to was Tareq Coburn but always felt that he looked tentative, lacking any fire. Brockington was the opposite and might be an under-the-radar kid to watch who can give Mark Schmidt some big minutes as the season progresses. Matt Mobley held up his end of the bargain in Jaylen Adams’ absence. The offense ran through him and scoring 29 points, Mobley showed he wasn’t afraid of stepping up when he had to. The only negative I saw was his four missed free throws seemed out of character. The Bonnies (who led the A-10 in free throw percentage last season) didn’t shoot well from the stripe in general on Friday but I was especially perturbed by Mobley’s misses as he’s typically reliable, with an 86% average last year. Obviously, the biggest negative was the loss itself to a vastly-inferior opponent. Not having Jaylen Adams on the court to run the show was a huge loss and it seemed as though the players were almost dependent on Matt Mobley to carry the load in Adams’ stead. Adams is the only true point guard and the Bonnies really need him back as soon as possible. The entire team runs through him. Courtney Stockard had flashes of brilliance. A beautiful spin move while driving in the lane to score and a huge three pointer, which put the Bonnies up in the second half come to mind. However, he seemed to lack foot speed and was a defensive liability whenever he was on the court. I’m hoping this improves as the season progresses and he gets his rhythm back after missing two seasons with injuries. Nonetheless, his scoring acumen was there and he should be a decent spark off the bench for the Bonnies. Josh Ayeni and Imadi Ikpeze didn’t produce as I was hoping. I’m high on both guys, Ayeni in particular, but neither guy stepped up the way LaDarien Griffin did. Ayeni was decent on the boards and I know he’ll bounce back. Ikpeze’s foul struggles from last season popped up again, however, with four fouls in just 11 minutes of action. The Bonnies need these two to step up going forward to get back on the winning track. I never want to be “this guy” but the refereeing left a lot to be desired. And this goes both ways. 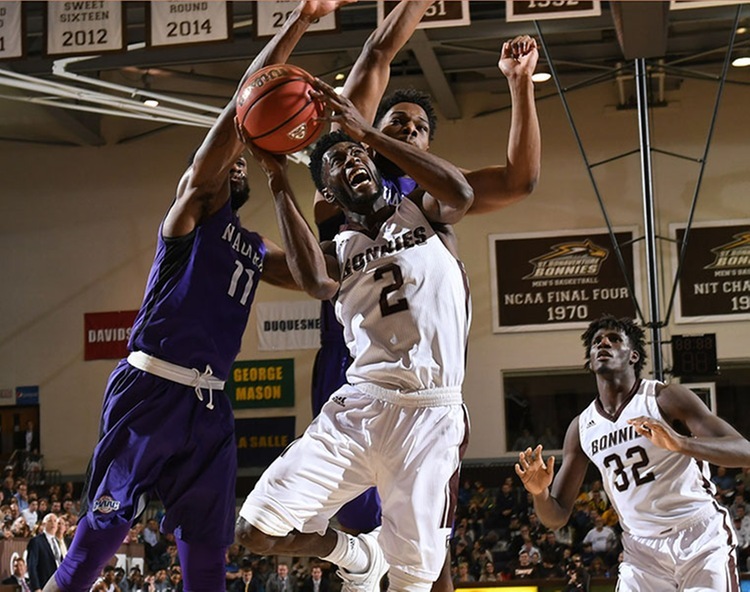 Refereeing wasn’t the reason the Bonnies lost – Niagara hit shots and SBU didn’t – but the game flow was never sustained with a plethora of odd…and let’s face it, puzzling calls throughout the game. It was almost as if the referees were basking in the glory of being the center of attention with each poor call. In my “WWE world”, they call that being a “heel”. Niagara’s Khalil Dukes was the real deal. I’m not surprised that he began his collegiate career in the Pac-12 at USC. His game reminded me of Jack Gibbs from Davidson with his shooting ability and even-keeled demeaner. Dukes hit back breaking shot after shot throughout the entire game. It seemed like every time the Bonnies would gain some momentum, Dukes shut the door on it with a big three-pointer. He netted 23 points on an efficient 8-14 (6-8 from three) shooting. The Bonnies need Jaylen Adams back in the lineup ASAP. He was walking gingerly in a boot but I still get the sense that he’s closer to ready than not. My gut tells me if Friday’s game was against a Rhode Island or VCU, Adams would’ve been out there. But it was painfully obvious that the rest of the team didn’t necessarily know how to function without him, putting more pressure on Matt Mobley to find answers. This team with Jay in the lineup is an entirely different one for the better. Follow us on Twitter, like us on Facebook, and check out our forum for more St. Bonaventure content.